DT Research has launched the DT372AP-TR rugged real-time kinematic (RTK) tablet, a lightweight military-grade tablet that offers RTK to enhance the precision of position data derived from satellite-based positioning systems. The tablet enables 3D point cloud creation with centimeter-level accuracy to meet the high standards required for scientific-grade evidence in court, the company said. 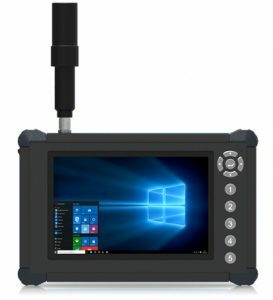 The DT372AP-TR RTK tablet is military-grade with an IP65 rating, yet lightweight — offering the versatility to be used in the field, office and vehicles. A dual-frequency GNSS module is built into the tablet, which uses real-time reference points within 1- to 2-centimeter accuracy to position 3D point clouds created from aerial photogrammetry, using GPS, GLONASS and Galileo satellites. Users can measure with the RTK GNSS positioning directly using an external antenna for better survey-grade precision. The DT372AP-TR RTK tablet is compatible with existing survey and GIS software for mapping applications and brings together an advanced workflow for data capture, accurate positioning and data transmitting. Forensic mapping. Public safety teams, investigators and crash reconstructionists can use the DT372AP-TR to accurately collect measurements that are scientifically and legally defensible by using the real-time centimeter reference points to position 3D point clouds created from aerial photogrammetry or take stand-alone measurements. By using the tablet with a drone for crime and crash scene investigation, cost goes down while accuracy and speed improve, helping to clear areas faster, thereby improving overall public safety. Land surveying. Surveyors can use the DT372AP-TR RTK tablet to measure the altitudes, angles and distances on the land surface so that they can be accurately plotted on a map to determine property boundaries, construction layout and mapmaking. E-construction. Construction workers can manage the collection, review, approval and distribution of highway construction contract documents in a paperless environment using the DT372AP-TR RTK tablet. High-performance CPU and Windows OS. Intel Pentium processor with Microsoft Windows 10 IoT Enterprise with 8 GB of RAM. Brilliant sunlight-readable display. A 7-inch LED-backlight, high-brightness (800 nits) sunlight-readable screen with capacitive touch and 1280 x 800 resolution. Superior wireless connectivity. Long-range Class 1 Bluetooth option powers connectivity up to 1,000 feet. Mobile broadband option. For best field connectivity, there is an option for 4G mobile broadband for LTE, HESPA+, GMS/GPRS/EDGE, EV-DO, Rev A and 1xRTT. Military standards. For use in harsh environments, the tablet is fully ruggedized to meet the highest durability standards with an IP65 rating, MIL-STD-810G for vibration and shock resistance and MIL-STD-461F for EMI and EMC tolerance. High-capacity hot-swappable battery pack. Delivers 60 or 90 watts for up to 15 hours of continuous mobile communications. Camera option. The optional back camera offers 5 megapixels, CMOS sensor and auto focus to capture project progress or record crash and crime scene details. Accessories. External antennas, pole mount cradles, battery charging kits and digital pens.